Colombia’s ELN rebel group has said it killed a Russian hostage when he tried to escape. The rebels said Arsen Voskanyan, a Russian citizen of Armenian origin, was shot dead in April. He was abducted in November, the rebels said, accusing him of collecting poisonous frogs to smuggle overseas. The rebels are holding peace talks with the Colombian government, but say they are unlikely to renounce their kidnapping policy in the near future. 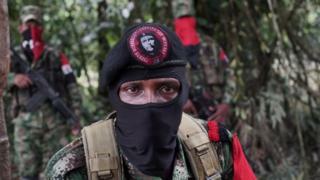 The ELN, or National Liberation Army, finances its operations mostly with the ransom paid to release hostages. The announcement of Mr Voskanyan’s death comes at the end of the third round of peace negotiations, which began in February. The rebels said Mr Voskanyan was being taken to a remote jungle area in north-western Colombia where he was going to be handed over to Red Cross delegates and freed. He suddenly grabbed a grenade from one of the fighters and tried to run away when he was shot dead, the ELN said. The information has not been confirmed by the Colombian government. The ELN and the Colombian government are hoping to emulate the success of peace negotiations with the larger left-wing Farc rebel group. After four years of talks the Farc signed a peace agreement last November.